NOTICE: If you will be registering for a Pesticide Workshop in 2019 a manual will be included in the price of registration. If you have questions please call The Education Store @ 765-494-6794. You can register for a 2019 class here. This training manual helps mosquito control operators prepare for the Indiana Category 8 Community-Wide Mosquito Control pesticide applicator certification exam. 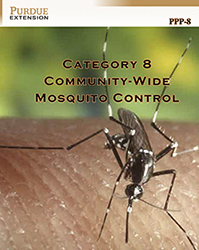 This publication replaces the former Purdue Extension publication, CAT-8 Community-Wide Mosquito Control.